I recently fielded a question from a journalist about the job prospects for workers laid off from nuclear power plants, and it turned out to be a case study in 21st century employment dislocation. It’s not just that there aren’t a lot of new jobs at utilities, or that layoffs have been hitting nuclear power plants in states across the U.S. The heart of the problem lies in the specificity of the workers’ skills and the challenges they will face in finding a job at their previous income level, but there are lessons here for workers, employers, and policy makers alike. On its face, it looks like a job seeker’s market in utilities as much as anywhere in today’s tight labor market. iCIMS data indicate that competition for the most utility-related jobs has declined by about 20-30% since 2015. In theory, laid-off workers should face less competition for getting replacement jobs at other utilities, but there are two big caveats here. First, the lower average number of applicants per position may reflect workers fleeing the industry as much as anything else – not unlike certain press reports of why it has been so hard to recruit new truckers. Second, since utilities tend to be local monopolies, they tend to be pretty spread out geographically. That means moving to another job in the same industry but a different location is more likely to be disruptive and difficult for utilities workers than for workers in other industries. This challenge is exacerbated by recent declines in geographic labor mobility across the U.S., which suggest it’s only getting harder to make such a move. What about switching industries? 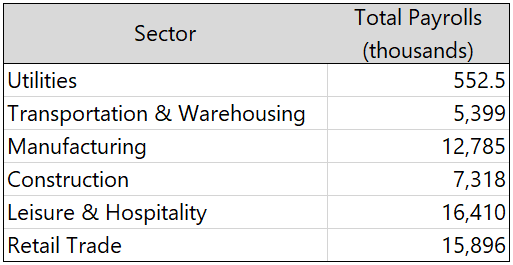 According to BLS data on total payrolls by sector, utilities is pretty small, so other industries might be able to absorb utilities workers fairly readily. However, the BLS reports that within power utilities in 2017, over 30% of the employees were in “Installation, Maintenance, and Repair Occupations” and many of those are likely to focus on machine-specific skills that do not translate well to other industries. Moreover, when you compare their absolute numbers, they actually dwarf their compatriots in the subsector of machinery manufacturing (which I've focused on to strip out less relevant categories like textile or agricultural manufacturing), although it’s true they are themselves dwarfed by their compatriots in broad sector of construction. Another 13% of the utilities workforce holds “production” occupations that often require operating task-specific machinery with one’s hands. While the further 11% who are in architecture and engineering occupations are usually considered high skilled, they may also be quite specialized and thus forced to accept some kind of pay cut if they transition to a new industry. Indeed, for most occupation types, the question of replacement income looms large. 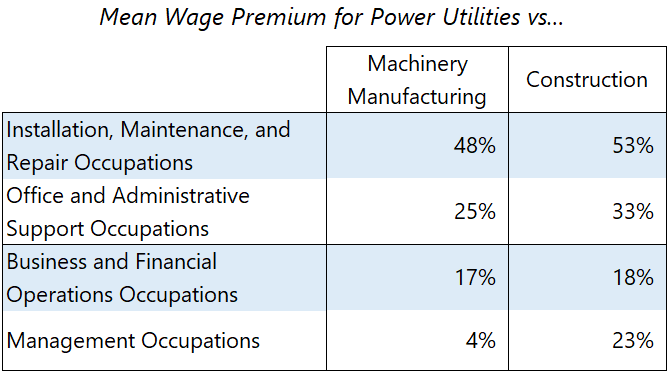 As the table below demonstrates, even when looking at the same broad occupational category, employees in power utilities have higher average wages than in construction and machinery manufacturing. This wage premium for utilities holds even when you look at occupations where you might expect that there is particularly strong overlap in skills across industries, such as administrative positions. It even holds across occupations like management and finance, albeit to a lesser extent. The higher wages may be related to the significantly higher rate of unionization in the utilities sector. Unfortunately, the BLS unionization data isn’t very granular, which may help explain why it doesn’t correlate perfectly with the differences in wages. Still, it seems notable that that wage premium for utilities is higher for administrative and maintenance occupations than accounting or management. This situation underlines our intermittent national conversation about the quality of new jobs. It’s a subject prone to bellyaching, but what do these facts and figures suggest can actually be done about any of this? Job seekers: if you haven't been proactive about updating your professional skills, here's another reminder of how important it is to keep learning and growing. 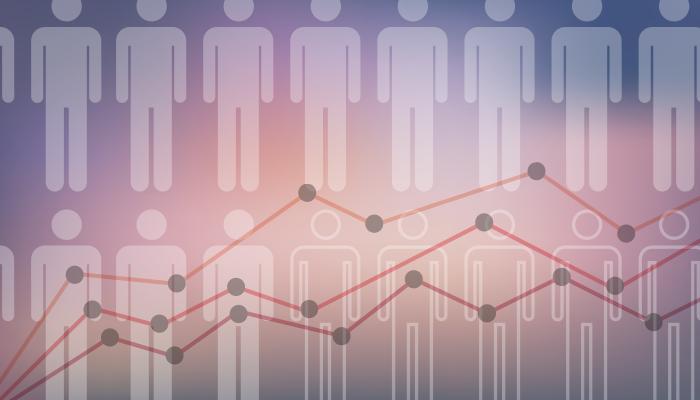 Employers desperate for workers in this tight labor market: think about advertising and recruiting among these populations, where you may find a receptive audience. Policy makers designing programs to place or re-train laid-off utilities workers: focus on the workers and supervisors in “Installation, Maintenance, and Repair” and “Production” occupations. The administrative workers probably have more transferrable skills, while the management and finance workers are far fewer in number and face less of a wage shock in accepting new jobs elsewhere.